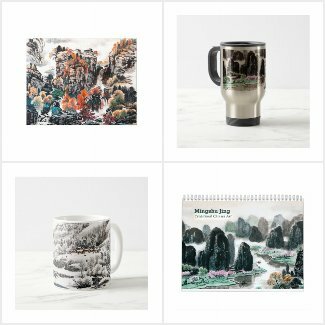 Plan to travel by China sleeper train? 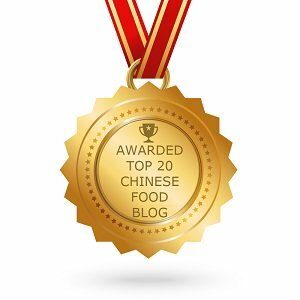 Here is my experience of taking the soft seat sleeper train from Beijing to Changsha, hopefully you can find something useful. 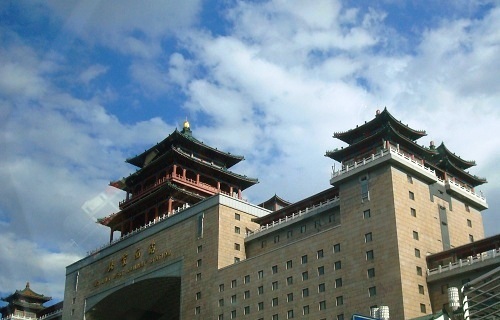 There are five train stations in Beijing (North, West, South, East and central). The East Station serves as a freight station. Which station to go is based on your destination, such as the soft seat train I took (from Beijing to Changsha) leaves at Beijing West Station. 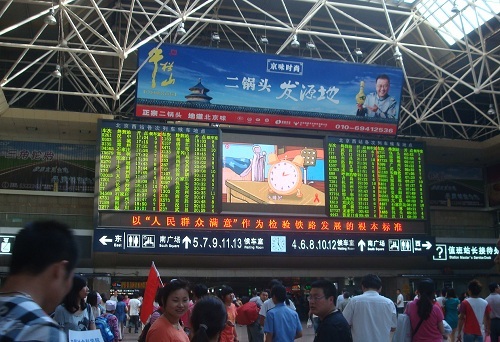 This is Beijing West Station. Before entering the station, there is security check for personal ID and luggages. Your personal ID number should match that shown on your ticket. 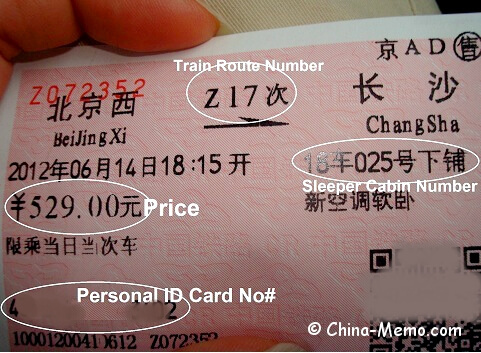 This is how China sleeper train ticket looks like. 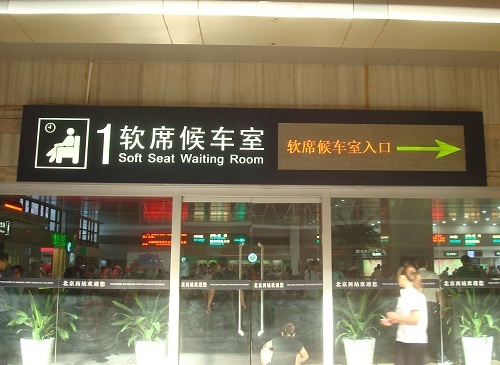 The name of stations is shown in both Chinese characters and Chinese pronunciation (ping yin). From 2012, you need to provide personal ID to get the train ticket. 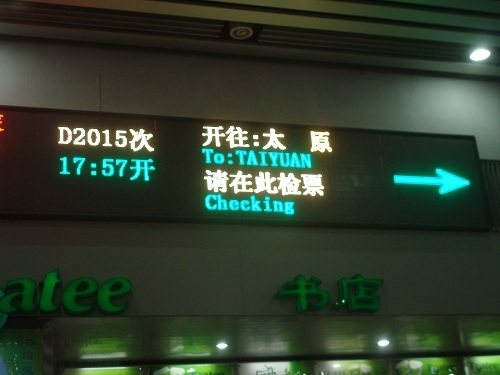 Once get in the station, you can check which platform to go from this big sign board. For passengers taking soft seat sleeper, there is a separated waiting room, from where you can check in and enter the platform earlier than those taking hard seat sleeper and normal seats. The waiting room is used for all soft seat passengers, so you need pay attention when your train is announced for check in. If you don't understand Chinese, then you may need to pay attention to the sign board near check in entrance, which has the English translation. 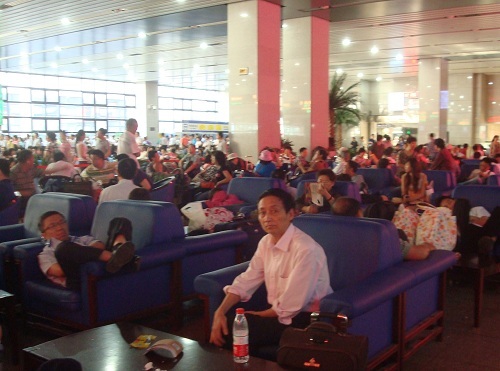 The soft seat waiting room has few small shops for snacks and books, but no cooked food. There will be cooked meal available on the train (restaurant car). Most Chinese like to buy a cup of instant noodles as the boiled water is available on the train. My favourite is the tinned rice porridge, which will be the breakfast before I arrive next morning. 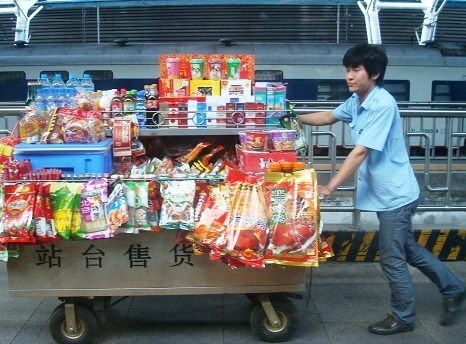 You may also buy snacks and cooked meals from the train platform if your train has the stops during the day time. But this is not the case for the overnight express train (the one I took was nonstop Z type sleeper train). 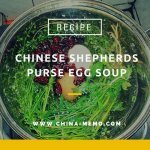 You may check my another post for China Train Food. Snacks and cooked meals can be bought from the train platform. Continue to read China Sleeper Train (2), where I talk about the boarding, sleeper facilities and pros and cons.